Thank you so much for your feedback on this wee series – I am so delighted that so many of you are finding natural colour shading so striking and cast-on-able! We know that there are lots of gradient packs of coloured yarns out there….mini skeins of unicorn tails or teeny balls of yarns like gobstoppers, but there isn’t the same choice when it comes to the same for naturals there isn’t as much in terms of lovely packs or nuggets of naturally coloured loveliness. 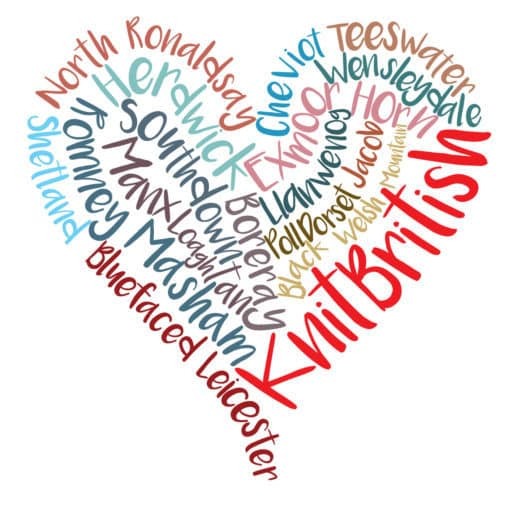 However there is a way to work with what you might have in stash…and being a reader of KB you probably have quite a few natural British odds and ends, yes?! I thought so. 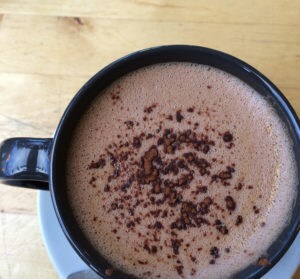 I heard about this technique from my Woolly Mucker, Felix, who made her hapalong hap using the method. Felix learned of the technique via Clara Parkes, wool maestro, and I shall link to it here. I thought – for the sake of demonstration, you understand – that I should make my own magic ball to show you. ANYTHING to procrastinate with yarn! 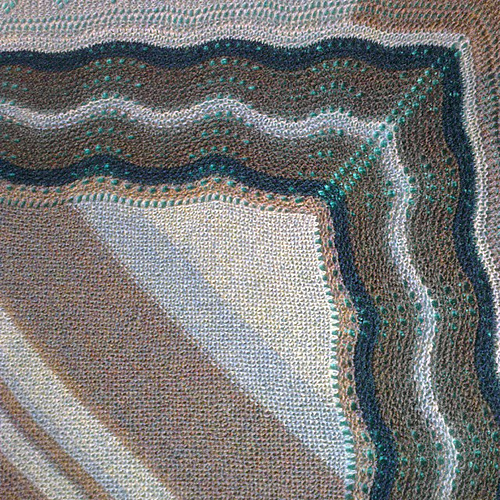 In my stash I have one huge box which is dedicated to natural shades of wool – full skeins and odds and ends – and I dug that out began piecing together harmonising shades. Mostly the yarn I used was Shetland, including some special edition Foula Wool jumper weight (not yet on their website) and some yarn I picked up at the Makers Market at Shetland Wool Week, Fair Isle Wirsit, also a jumper weight (and not online yet either, sorry! but watch this space). I also found some Castlemilk Moorit and Hampshire Down to throw into the mix. To my mind there are a few ways you could make your magic ball – go for broke and just join your colours in a playful way and not pay much attention to which colour follows which, or how long each ball is; or be a bit methodocal – if you had a certain pattern in mind and you really wanted to play with colour placement then you could have a lot of fun measuring out colours and joining them in a way which would make a spectacular gradient. I don’t have a pattern in mind and so I decided that I would make 2g balls of each colour, of which I had 6 different shades. Each colour had about 8 little 2g nuggets each – and can I just pause to say how much fun that part was? Balling yarn is always lovely, but lots of sweet little balls was too cute and I LOVED seeing the potential of the colour changes as I laid them out in the order that I wanted to join them. There are no rules on how you do this, you could opt to do much larger sections of colour changes but again, no pattern in mind and in the name of playing, I opted for my colour change from lightest to darkest and decelerating back through the spectrum to lightest again. For joining the colours there are a number of techniques you could use; spit-splicing, Russian Join, or magic knot. I like the old spit splice (no, you don’t *have* to use your spit). If I thought winding the teeny balls was fun it was so delicious joining and winding them onto one ball and watching the colours change. My finished natural colour ball of magic British Breed wool is just under 100g…but what to knit? 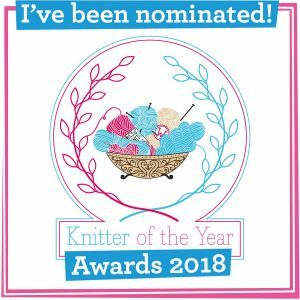 You might remember me falling a bit in love with K M Bedigan’s Evremond Shawl and how I craved the garter and brioche warmth in natural colours. | No Odds and Ends? 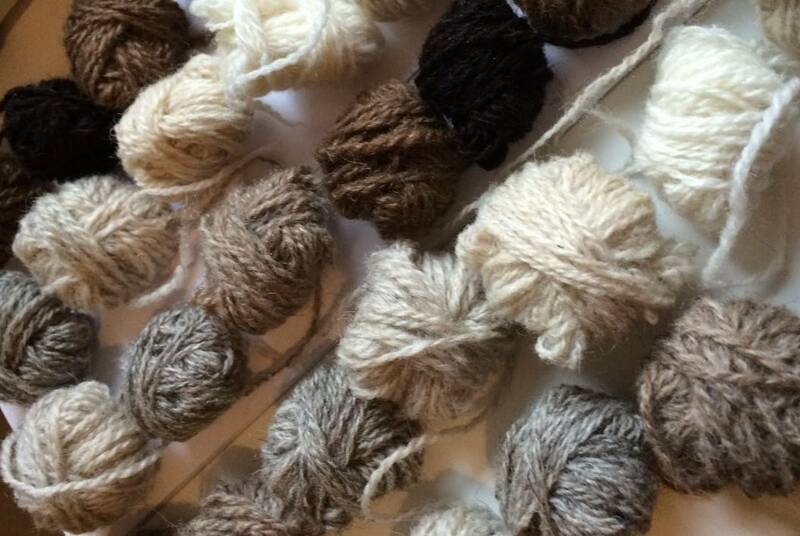 So maybe you don’t have a big stash of natural shades, or any odds and ends and you still want to make some stunning gradient yarns, what is best? Well, we know that there aren’t the same teeny packs of colours out there like out hand-dyed yarns, but there are some smaller skeins out there for those of you who don’t want to be buying 50 or 100g balls. 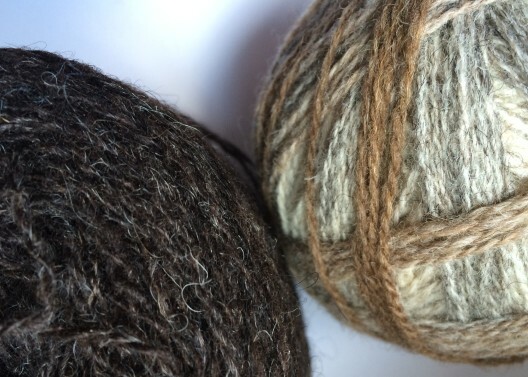 Jamiesons of Shetland and Shetland Wool Brokers, Jamieson and Smith have 25g balls of all their shades of lace and jumperweight, which, of course, includes their natural shades. 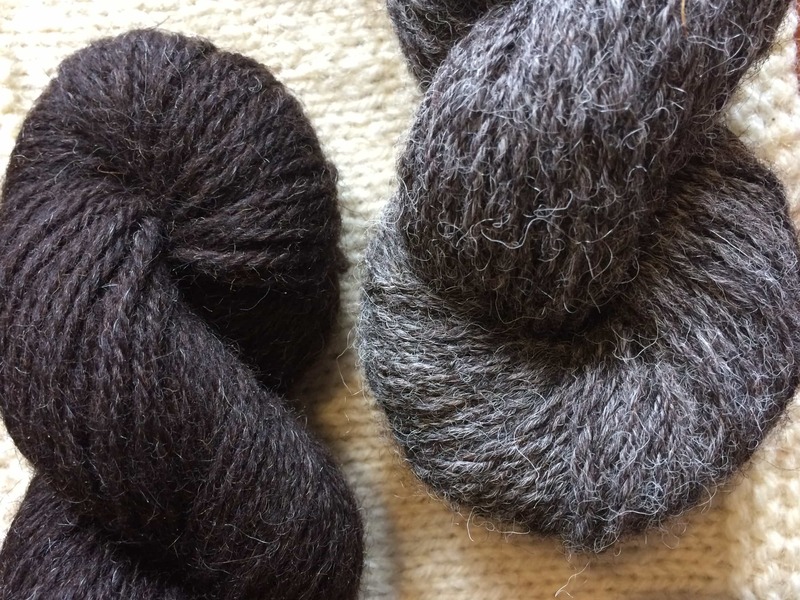 Foula Wool, as I mentioned earlier, do 25g cakes of their natural shades too – they are even photographed in perfect gradient selection in the shop too. 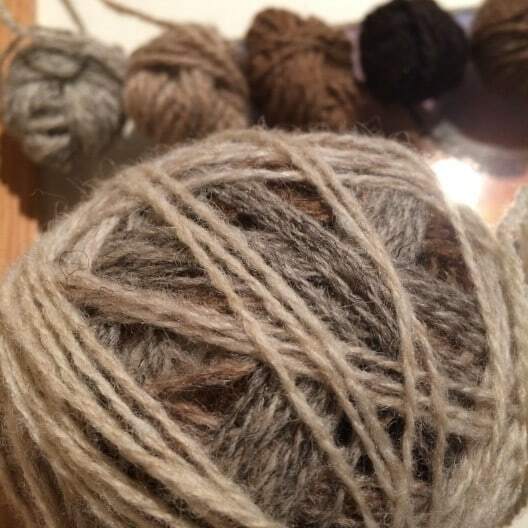 For some reason it’s only really Shetland wools which come in these 25g balls – I often wonder if more British breed natural yarn were available in this weight more people would be keen to try them. Of course, if you have full balls of yarn and you don’t want to make teeny balls out of them you could put two or three together for a more striking change. I chose my colours by eye, but if you wanted you could choose your gradient yarns using the same technique as choosing yarns for colour value in Fair Isle knitting. 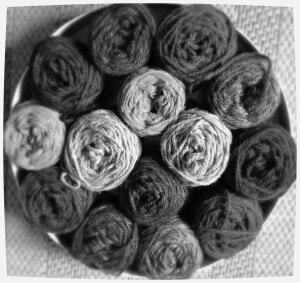 By using your camera (I use my phone) you can take a snap of your yarns and by using the mono filter you will be able to see which colours are harmonious together and which need balancing. It is such an easy technique to ensure that you get just the right kind of sweep in your natural colours. Are you all going to head straight to the stash to look for magic-ball potential?! I must say that not content with my magic ball of small colour changes, I am wondering what I could do with larger colour changes and the leftovers in my stash from which I made the teeny balls! Next time I am back on this topic with some colourful designs we could go grayscale over! See you then, magic readers! 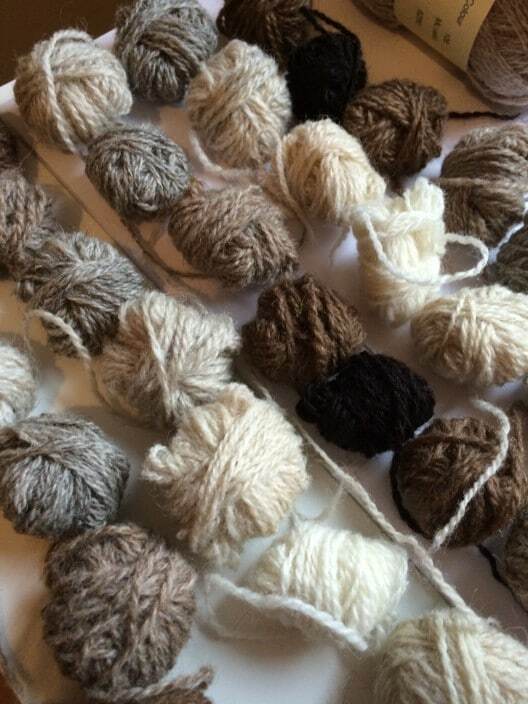 These natural colours are so beautiful, and thank you for the link to “spit splicing” …now I can see where mine went wrong, I didn’t remove a little of the wool before rolling my ends together so ended up with yarn that was a bit podgy like a post Christmas tummy. I know you’re “Knit” British, but if anyone crochets then I think this would be a good way to work some granny squares, I’m thinking especially of the “grannies paperweight” pattern which works very well with subtly changing tones. oooh, that Evermond shawl will look gorgeous with your magic ball. I will have lots of bits of skeins left after my breed swatching and I love the idea of weighing them out into little balls and arranging them by gradient. I’m thinking I could knit a nice border for my eventual blanket with them all.